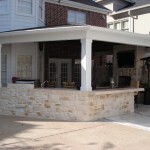 How ’bout this for an outside kitchen design idea: Houston outdoor kitchen designs with TVs for football season? After all, outdoor living spaces always become huge hangouts when the game’s on. Cold drinks, hot steaks off the grill and catching the game with friends are all more fun in the shade of a covered outdoor kitchen or patio. But a cabana with a TV, outdoor kitchen, bar and grill – like the one shown above – is just one of many designs you can choose. The large, 55-inch flat screen TV in this Houston outdoor kitchen design allows you and your guests perfect sightlines to the TV while you’re taking care of food and drinks and they’re watching the game. 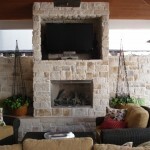 The TV and comfy seating are in a 12-by-8-foot outdoor living space with a custom audio-visual cabinet faced with Western Austin Limestone (components, remotes and DVDs are hidden behind the stainless steel doors at the bottom). Behind this outdoor living room is the L-shaped, 8-foot-long outdoor kitchen island with a built-in commercial grade RCS grill and outdoor refrigerator and an outdoor icemaker. The counter’s raised back also creates a bar where stools can be added for additional seating. When not in use as a football-watching hangout, this Houston outdoor kitchen allows the kids to watch movies and TV on one end while the parents entertain guests on the kitchen-and-bar end. 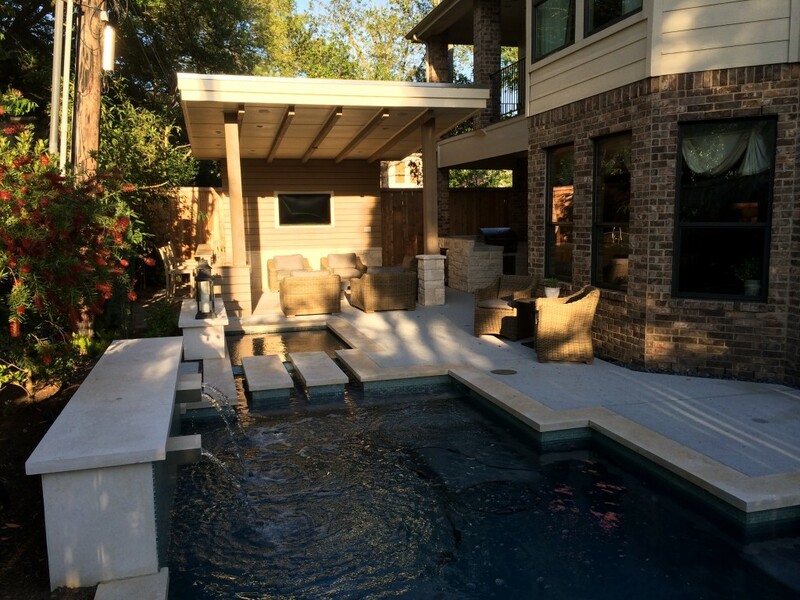 This Houston outdoor kitchen design not only offers football game viewing from the built-in hot tub, but easy access to cold drinks and food. 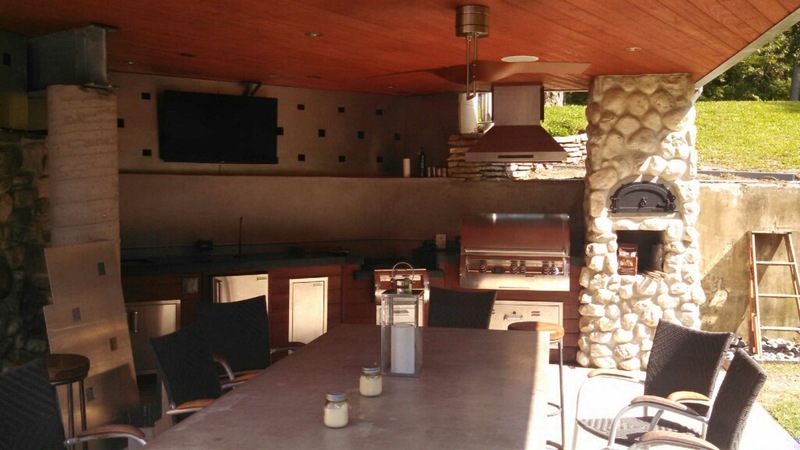 This Houston outdoor kitchen features a huge 55-inch flatscreen TV, slab concrete table, stainless steel walls and a killer e790 Echelon Fire Magic commercial grade grill. It’s about as manly as an outdoor kitchen can get. And why not? In the Saber Grills 2014 Outdoor Living Survey, 30 percent of male homeowners said they’re solely responsible for decorating decisions in their outdoor space. And just over half (53 percent) of outdoor decorating decisions are made by men among first-time homeowners. And – since this homeowner likes to play sports as well as watch them – this yard also has volleyball and basketball courts. Players can cool off afterwards with drinks, thanks to the built-in refrigerator and icemaker. Meanwhile, pizza made in the outdoor pizza oven or wings, ribs and burgers from the grill can be kept in the warming drawer underneath the grill. 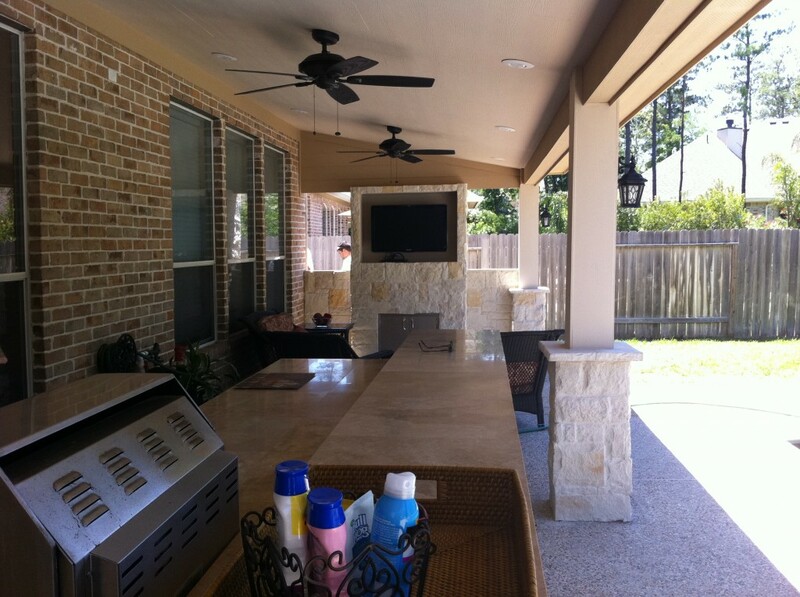 This Houston outdoor kitchen is perfect for catching the football game – especially when the weather gets colder. Super comfy cushions and pillows warm up this space functionally and visually. And a built-in fireplace below the TV adds extra heat in the coldest part of winter. The outdoor kitchen counter to the right also has a bar where stools can be pulled up for extra seating. QUESTION: Which football-friendly Houston outdoor kitchen do you like best? Post a comment and let us know! 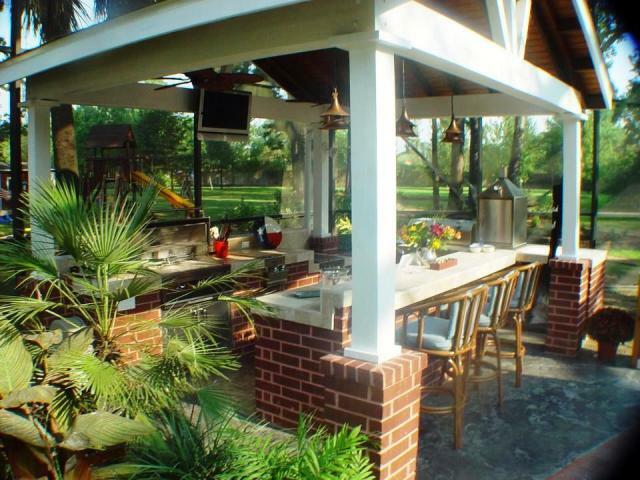 You can also feel free to browse our Houston outdoor kitchen pictures on Houzz. 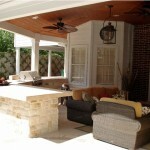 Or, if you’re ready to get started with your own Houston outdoor kitchen project, just contact us!